New York Attorney General Eric Schneiderman uses crowdsourcing to call out internet service providers on their speed claims. Sometime it truly pays to vote. New Yorkers, for example, can laud their choice of Eric Schneiderman, at least on this one count: he is making, it his mission to get to make sure consumers in his state are getting what they pay for in their internet service. Does it feel like your internet just crawls sometimes? Well if you live in New York State there is something you can do about it, thanks to the Attorney General. He is fit to be tied about sluggish downloads, slow-loading websites, and the (sometimes) miserably slow pace of data transfer in general when it comes to getting things done online. His mission? To find out if consumers in New York State are really receiving internet speeds as advertised… especially those paying for premium (i.e “faster”) service. This guy knows his stuff… he is using a thoroughly modern approach to the issue: crowdsourcing. On December 13, 2015 he announced to New York residents his plan to engage their help. They are invited to visit internethealthtest.org, where they can click through a series of websites. When done, they will have a measure of their average internet speed. Then, they take a screenshot of the results and submit it right there. The public’s submission of screenshots will be used as “evidence” in his investigation. What’s The FCC’s Role In All This? The Federal Communications Commission (FCC) – an independent agency of the United States government to regulate interstate communications by radio, television, wire, satellite … – does have a speed test website but it’s a hobbled horse compared to the thoroughbred racer Schneiderman has produced. For one, participation in the FCC version has been very limited so far. Secondly, the FCC’s website does not even measure your true internet speed. It merely measures the “last mile” of data transfer, not the speed of the entire journey from source to your personal device. That is like saying your London to New York flight takes 45 minutes because that’s how long it takes you to from your home to the airport. Data, it turns out, travels across networks owned by separate entities. Only during that “last mile” is the data traveling purely across your Internet Service Provider’s (ISP) own network. Therefore, there are cross-network agreements involved, and those are the points that matter when it comes to your actual internet speed. Schneidermans’ speed test measures actual “throughput”, which is the entire journey of data. His test measures the throughput at several points along the line, so his office should eventually have an idea of where things are getting bogged down. There is another big fail at the FCC: their internet speed test requires users to submit way more private information than New York’s. The reason the New York State speed test has users submit is a screenshot is that it’s pretty anonymous. All you have to submit is your screenshot…no IP address, browser history, etc. Name and zip code are voluntary. The FCC has more power to enforce cases like the one emerging from the NY State Attorney General’s office. Thanks to the Net Neutrality laws that went into effect in 2015′ summer, they can now do something about internet and phone companies who do not fulfill their promises of speed, quality, and reliability. If internet speed test data show a violation, there will be charges. 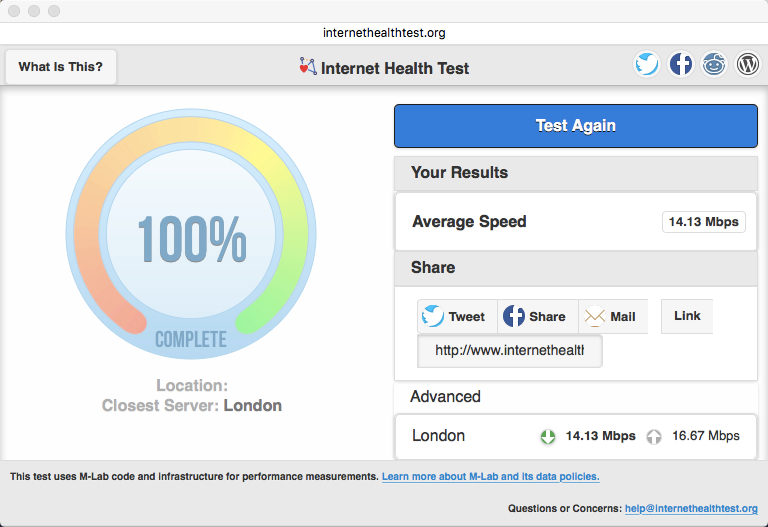 If you do not have the good luck to live in the state of New York, there is an internet speed test for you, too. It’s BattleForTheNet.com. Already, more than 300,000 people have submitted their data from that site and already there are some dismal results. It did work from London too ! And sure enough the slowdowns are at interconnection points, which lie beyond the reach of the FCC’s internet speed test. Interconnection points are where data you are trying to reach gets transferred between your ISP’s network and the network of the server that hosts the information you are trying to get. The FCC’s speed test may be the lamest game in town for some, but they are actually the ones putting teeth into this game. In June 2015 they fined AT&T Mobility LLC 100 million USD for misleading their customers about internet speeds. The case was called “Open Internet Transparency Rule Case” and is currently in litigation in federal courts. And meanwhile, Attorney General Schneiderman is collecting his data, preparing to wield the mighty sword of New York’s legislature at the big three providers in his state. You have might heard “Don’t mess with Texas”…well New Yorkers will always give you a good fight too, when the cause is just and the results end up helping everyone. T-Shape Entrepreneurial Director | Tech & Business | Passionate About Collaboration, Building Agile & Effective Teams | Leading Agile Teams @ EPAM I have an extensive technology and business exposure, international experience working from start-up to blue chip global companies, a proven track record of successfully delivered global strategic information technology projects and services. Passionate about collaboration, service delivery, operation, building Agile & effective teams; I am accomplished in all aspects of application and infrastructure services delivery as both an insourced and outsourced function. I have demonstrated an ability to build and maintain exceptional stakeholder relationships at all levels. Motivated and enjoy the challenge of working in passionate and diverse environment leveraging IT to help bring products to market that positively impact the lives of millions of people worldwide. From product vision to design and execution, my expertise come to help my clients realise their vision.